These days, I feel I could re-wire my entire blog to write about celebrities ensnared in deadly addiction and depression (after writing about Phillip Seymour Hoffman in “Skewer the Stigma” in February…) and that makes me really sad. For every well-known person who takes his or her life – or dies from an overdose – there are mothers, fathers, siblings, and friends of “real” people who lose the battle every single day. And that makes me more sad. They are your Hollywood icons and musical geniuses – yes…but they are also your family, community, coworkers and clergy. God bless the brokenhearted, and let the awareness spread. The news of Robin Williams passing hit me hard. I was checking my texts while walking out of a 12-step meeting when my daughter messaged me. The tears were immediate. After all, I felt like I knew him. Didn’t you? Didn’t he make you believe in interplanetary rapport, as an alien in “Mork and Mindy”? Didn’t he inspire you as the wartime DJ in “Good Morning, Vietnam” who brought smiles to soldiers in the midst of misery? Didn’t he make you secretly wish he was your father-slash-nanny, as Mrs. Doubtfire? Even as he made flawless comedy, there was a sadness behind his laughing eyes. It was palpable. In the mind from which flowed such beautiful, authentic art, he no doubt felt hopeless. The news sources say that “rehabilitation came too late for him.” And this breaks my heart anew. I am not sure I believe that. 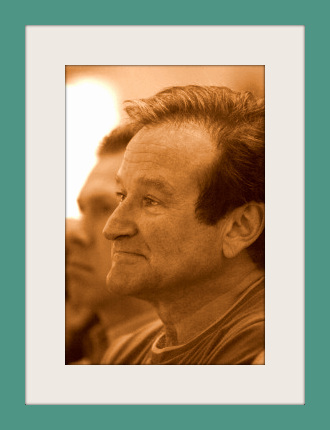 It is never too late for hope to take hold, and I wish Mr. Williams had been in a place to realize that. Didn’t he know that things always, ALWAYS get better? It is a law of nature – things get bad. And then they get better. But his spirit just ran out of the patience for the better to come. He was – by all accounts – a good person. Being a good person has precious little to do with suffering depression and addiction. If anything, sufferers of both struggle mightily, since they are generally sensitive to those around them, attuned to sadness and anger and joy – all of the empathetic humors. Addicts and alcoholics self-medicate with booze and/or drugs in a futile attempt to stop feeling hopeless. Of course, more hopelessness ensues as the addiction surges like dragon, breathing more fire on the already-scorched earth of your spirit. I’ve never attempted to take my own life, but I have battled depression a few times deeply enough to consider it. At one point, I remember thinking – very nonchalantly – that I just didn’t want to exist anymore…that I would honestly be doing my family a favor if I just ceased existing. And the most terrifying thing about that thought was the aplomb with which these thoughts presented. I was all cried out, all screamed out, all worn out. And really tired of being disappointed. I could not imagine ever being in a non-exhausted state and living with an ability to get up in the morning and dress myself without resentment for having to do so. It is a dark, lonely place. I hated living in this flawed body, with chronic pain – both physically and emotionally. And Neverland is only a place where reality has been plundered and ravaged. The flat, casual tone of my suicidal thoughts alarmed me enough to seek help. I cannot tell you what would/should/could have worked for Robin Williams. Or you. Take one single day at a time, because the law of nature is that things do get better. You just have to ride out one more day and rely on the God who says he loves you even in those times (especially in those times.) No matter who you are, He has a plan for your life that would just blow you away. The old “don’t give up before your miracle arrives” platitude? It seems there is truth to it. I have lived it firsthand. Hopelessness is an illusion. There is always hope. The world needs me, and it needs you. It needs your message and your energy, the fingerprint of your love influence on the lives of those who love you. God knows we could have used more of Robin Williams on this earth. Rest in peace, Mr. Williams. I feel like I knew you. Rest in peace, knowing you brought joy to millions of people…knowing you endeared yourself to countless people in your 63 swashbuckling years here on earth. The world needed more of you – even so, rest now. God be with you and give you shalom everlasting. Go, Robin – and be well.